Members Only, with the exception of Bowl Busters. See below for details. Doors at 12:00pm. Chips in by 12:45. Games at 1:00. Game starts at 1 pm. Get your chip in by 12:45 and help set up the rinks and get some warm up rolls in. In dead of winter our hearty men and women "Bowl on!" Doors at 5:30. Chips in by 6:45. Games at 7:00. This league has a little of everything: delicious food and drinks (potluck), great conversation, awesome music, and bowling as the sun sets. Competitive yet casual gameplay. 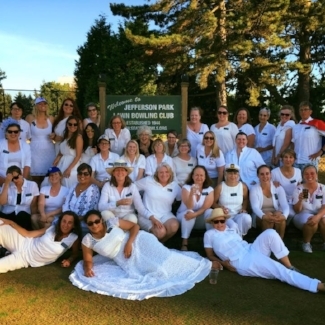 This is not your typical lawn bowling league. How many lawn bowling leagues have an anthem? Relaxed, yet competitive, we don’t take ourselves too seriously. Contact: mwbb@seattlebowls.org. To play in the Odd Couples league, players sign up as a team. Your team can consist any combination of two men, two women, or one of each! Structured as a round-robin style of play, you and your partner will play as a team* each week throughout the length of the league. Each team will play all the other teams at sometime during the length of the league. *Although you play on a set team each week, it is ok to find another member to sub for you if needed. Only for hardy, fun-loving, intrepid Northwest bowlers who say, "If you can’t take the rain, move to Sun City!"